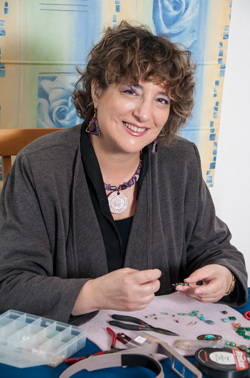 I am a self-taught jewelry beading artist, working from my studio in Ramat Yishay, Israel. The love for color, transparency & texture were reflected in my watercolors as a child, in my designs as a graphic artist later and at present, in the beads and gems of my jewelry. The embrace of nature on the ever-green Mt. Carmel as a younger person and now in the lush Yizra'el Valley is my inspiration. I'm attracted and influenced by those ancient cultures that had daily interaction with nature. I weave semi-precious stones, crystals, ceramic, glass, seed beads, wood & metal objects into my work. The collector in me ensures that my drawers overflow with found objects waiting for their turn to be incorporated in a new piece of jewelry like a story waiting to be told, a picture waiting to be drawn. The jewelry I create with so much love, being a whole finished piece, needs to be fitted, at times, to the woman that fancies it. In the process, I take into account HER dream, Her fantasy, Her personal saying and, naturally, her physical features. I aspire that, wearing it, she will feel attractive and feminine with her choice. A few years back I found a new passion – sharing my creative joy with others. Teaching a small group of women around the table is empowering and has its magic. I took a course in "Haruz Caze" Beading Academy and I am an authorized beading instructor. Ever since, I divide my time between my own creations and teaching both women and young girls, age 6 and on. The development of their new-found color & form taste never cease to amaze me and bring me joy.